Sally Montague Hair Group is proud to participate in ‘My New Hair’ - a respectful, compassionate and professional service providing advice, information and support for people experiencing medical hair loss. - Help you to choose the right wig, for a natural and attractive appearance. 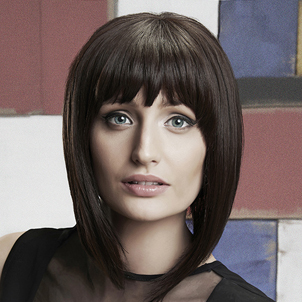 We have a selection of high quality wigs available to personalise. - Providing you with a wig personalisation service including expert styling by professional specialists. Sally Montague and Sarah Fletcher (Ashbourne & The Old Hall) are the trained Stylists offering the service, for more information about My New Hair or to make an appointment with Sally Montague please call The Old Hall (01332 331133) where we have private facilities available. To make an appointment with Sarah please call Ashbourne (01335 343 893). The ‘My New Hair’ service is priced £60, this does not include the wig which vary in price. Being part of the initiative has been an emotional rollercoaster for Sally Montague, whose chosen charity was Breast Cancer Care for many years prior to her involvement with My New Hair. “My mother-in-law suffered from Breast Cancer and a member of staff lost her mother to the disease, so we have always shown our support with charitable initiatives over the years,” she says. Although often asked about wig cutting by clients, it wasn’t something Sally offered until she was approached by the My New Hair initiative, which was looking for affiliates throughout the country to join its network of hairdressers. “My New Hair asked if I would represent the East Midlands region, so my manager, Sarah Fletcher, and myself were educated by Trevor Sorbie so that we fully understood everything involved in offering a service as sensitive as this,” says Sally. Part of the training involved spending time with Macmillan nurses, ensuring Sally and Sarah could gain an in-depth understanding in to the emotions felt by those suffering from the disease. “We were trained in what – and what not – to say, and while we can’t ever profess to know just how our clients feel, we can offer compassion and understanding of their situation,” she says. An emotional experience for everyone involved, clients sometimes bring friends and family to help them through. “Being diagnosed with Breast Cancer and then losing their hair is a traumatic experience for everyone involved and we accommodate our clients and offer privacy, understanding and compassion,” says Sally. Most appointments are held in the private White Room in the Old Hall in Derby –“The White Room is often filled with tears, laughter and lots of cups of tea!” recalls Sally, who describes the work she does for My New Hair as ‘a humbling experience’. Being part of the My New Hair network has, Sally says, been the most emotionally challenging and rewarding work she have ever done. “Losing your hair can seem like you are losing your femininity. By offering this service and ensuring clients leave with hair that looks natural and feminine again, means ladies are not so alone, not as vulnerable and have the confidence to face the outside world once more. Throughout the consultation process we help clients choose a wig that will best suit them, taking into account colouring and skin tone, which often changes dramatically following chemotherapy. We work in an advisory capacity to help them in what is initially a painful part of the process, and with our help and understanding we ensure that our clients leave with the confidence they often lack when they first arrive.